Hello, so I recently acquired a Gravis Ultrasound Classic, Rev. 3.7, with 256k of RAM. I installed it in my K6-2 450Mhz (the oldest computer I have at the moment), motherboard Soyo 5EHM, with Windows 98SE, in DOS mode. I set the address jumpers to 240, installed the 4.11 drivers and rebooted, again in DOS mode. Now, the midis that came with the drivers (I think it was something like MIDIDEMO.BAT) do sound perfect, but I have some issues with games. For example, in Rise of the Triad shareware, the menu music and the setup music sound fine, but the Apogee intro and the level 1 music ("Going Down the Fast Way") lack drums. Also, in the level 1 of Doom II they sound kind of muffled, but all the other instruments are ok.
My question is, am I supposed to configure something else; or it may have something to do with the ammount RAM it has? I'll do some further tests later today, but any insight will be appreciated, thanks! It may possibly be the amount of RAM - most cards had 512k, iirc? Does the readme for ROTT say anything about the amount of memory required? Do you have the original patch files or the expanded pro pats set? The latter has some bigger samples and might be causing some samples to not load. The ROTT Shareware episode doesn't have a readme I think (at least the 3d Realms site version), but the full version manual doesn't say anything about it. As I have zero prior experience with these sound cards, I don't know anything about the patches... but I installed the 4.11 drivers, so probably I have the ones that come with those? I also believe the issues are due to the amount of RAM your GUS Classic has, fantasma. I happen to have a GUS ACE in my P166mmx retro-build; it originally came with 512k of RAM, and games like Doom, Raptor, Duke Nukem 3D and Descent had the same type of problems - midi music that had missing and/or muffled instruments. I tried a few suggestions, but the only solution that worked best was to upgrade the RAM to 1meg. JayCeeBee64 wrote: I also believe the issues are due to the amount of RAM your GUS Classic has, fantasma. I happen to have a GUS ACE in my P166mmx retro-build; it originally came with 512k of RAM, and games like Doom, Raptor, Duke Nukem 3D and Descent had the same type of problems - midi music that had missing and/or muffled instruments. I tried a few suggestions, but the only solution that worked best was to upgrade the RAM to 1meg. Yeah, that's probably the issue, since I've tried lots of different combinations of addresses, dmas and irqs; and the problem is still there, so it's probably installed correctly. Otherwise I think I should get an error or something. Do you guys know if there are some common electronics I could scavenge those memory chips from? Or if they are still sold somewhere online? Thanks! EDIT: Maybe these could work? Looks like they might work, although I'm not 100% sure. Maybe someone else can confirm? JayCeeBee64 wrote: Looks like they might work, although I'm not 100% sure. Maybe someone else can confirm? Well, I went ahead and ordered six of them, since they are cheap (less than $2 each), and also they are the model mentioned in the manual (D424256C-80). I should have them here in a couple of days. Will report if they worked and if they solved the problem! Usually GUS support in games requires 512 kB RAM. 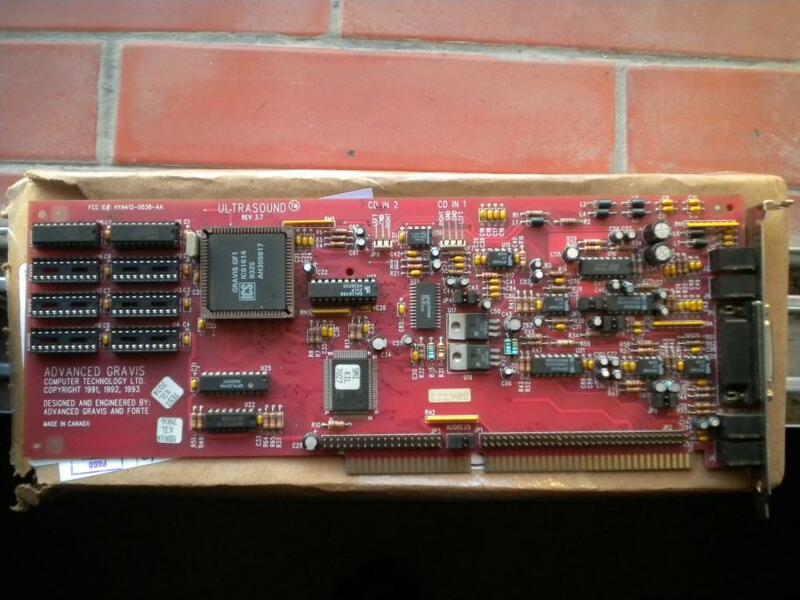 But since the RAM it is cheap it is strongly recommended to equip the card with 1 MB. Some later games as Death Rally require 1 MB GUS RAM. The missing instruments issue is probably due to the instrument patch loading of the game. After 256 kB are filled all other instrument samples are dropped. So it is basically a fallback since your 256 kB GUS doesn't meet the minimum requirements. Yesterday I received those D424256C-80 chips. I was prepared for a letdown since they are obviously used and super old, but they worked fine. And what's even better, the missing instrument issue is gone. So you guys were right, that was the problem, it sounds superb now! Thank you all for your help.